In 2012, we decided to animate the display to music. We used over 15,000 lights and just a "few" extension cords throughout the yard and house. In 2018, we have grown again adding new songs and exciting lighting effects with over 35,000 lights!!! 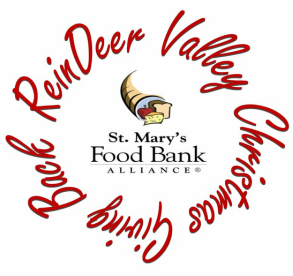 We would like to give a special Thank You to all who donated to our 2017 food drive for St. Mary's Food Bank. With your generosity, we were able to donate an all time record of more than $675 and 200 pounds of food!!! Also, experience our weekend magical snowfall!! Plus, see Santa and the Elves working hard in his toy shop for this year's Christmas in our front window. We are hosting our 6th annual food drive﻿﻿﻿﻿ for ﻿﻿﻿﻿﻿﻿﻿﻿﻿﻿﻿﻿﻿﻿﻿St. Mary's Food Bank﻿﻿﻿﻿﻿﻿﻿﻿﻿﻿﻿﻿﻿﻿﻿ (Donation Box will be on the driveway); we appreciate food and cash donations in helping us fight hunger.